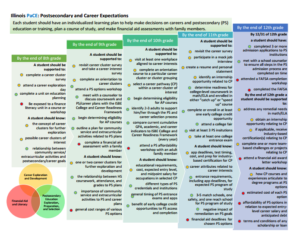 Defining Postsecondary and Career Expectations: The law calls on a joint committee (including the State Board of Education, the Board of Higher Education, the Community College Board and the Student Assistance Commission) to define specific, grade-level expectations for career and postsecondary exploration. These expectations, which cover grades 8 through 12, are to be published by July 2017. 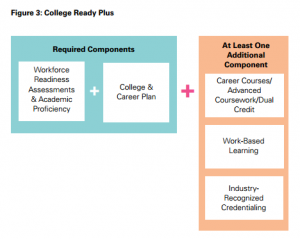 Piloting a Competency-Based High School Graduation Requirements Program: A new pilot program established under the law will permit selected school districts to replace current graduation requirements with competency-based learning systems. One challenge with competency-based education is evaluating student learning in a way that is recognized by colleges or employers. As such, the law requires participating school districts to create a plan to assess student mastery and to partner with two-year and four-year higher education institutions to ensure that a competency-based system can still provide colleges the information they need to admit incoming students. Establishing a College and Career Pathway Endorsement Program: The endorsement program is designed to recognize student learning and incentivize entry into high-need career pathways. To be eligible for an endorsement, students must develop and maintain an individualized college and career plan, complete at least two years of coursework on a career pathway that leads to a degree or certificate with labor-market value, complete career exploration activities, and demonstrate readiness for non-remedial coursework. Providing Transitional Instruction in Math and Reading: Finally, the law calls on community colleges and K-12 school districts to reduce remedial education in college by creating transitional math and reading opportunities in 12th grade. These classes will help prepare students for credit-bearing college courses and, as such, will be recognized by colleges across the state. In developing competencies for instructional coursework, the law also requires the state to draw on expertise from private sector employers. When North Carolina passed its budget for fiscal year 2016-17 last month, it launched a new pilot program to encourage student learning in high-demand industries. The program â€” which will start immediately, using data from the 2015-16 school year â€” will reward Career Technical Education (CTE) teachers with up to $50 for each student who goes on to obtain an industry-recognized credential. The size of the reward will depend on the academic rigor and employment value of the earned credential. Academic rigor will be evaluated based on the instructional hours, work experience and postsecondary credit that are associated with the credential. The second value criteria, employment value, will consider the entry wage, growth rate and job opportunities for the occupational category. 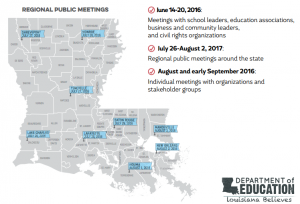 Before the pilot program sunsets in June 2018, the State Board will report back to the legislature on the amount of awards provided, the number of industry credentials earned, and the effects of the program on teacher performance and retention. College is often considered a safe bet, but new research from the Center for Public Education (CPE) finds that comparable opportunity can be found in rigorous high school programs that result in aÂ professional certification. 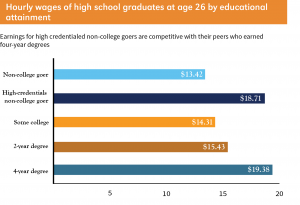 In the third installment of its â€œPath Least Takenâ€ series, CPE compares social and economic outcomes between students with a four-year college degree and â€œhigh-credentialedâ€ students with no degree (the paper defines â€œhigh-credentialedâ€ students as those who demonstrated success in high school academic and technical courses and obtained a professional certification). The study finds that â€œhigh-credentialedâ€ students with no degree were just as likely to be employed full-time, be satisfied with their jobs and to vote in a recent election by age 26 as students with four-year degrees. The study also finds that, among students who pursued but did not complete a postsecondary degree, those who graduated from a rigorous high school program had more positive social and economic outcomes overall. This demonstrates that rigorous college and career preparation in high school can serve as a powerful economic safety net along the path to a higher degree. In other news, Urban Institute and the Aspen Institute released an evaluation of Accelerating Opportunity (AO), a program designed to help adults with low basic skills earn occupational credentials and obtain well-paying jobs. One innovation that AO uses is to change the delivery of adult education by pairing basic skill instruction and technical education so that students can earn Career Technical Education (CTE) credits and a high school credential concurrently, placing adults without a high school degree on a path towards a high-wage, high-skill job. The evaluation finds interesting outcomes from the first three years of the program. 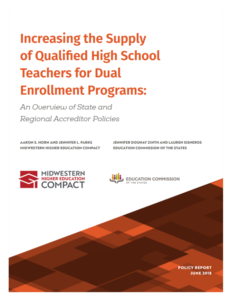 Of the more than 8 thousand students enrolled in evaluated states (Illinois, Kansas, Kentucky and Louisiana), one-third engaged in work-based learning and 30 percent found a job related to the occupational area of their pathway within the first three years. 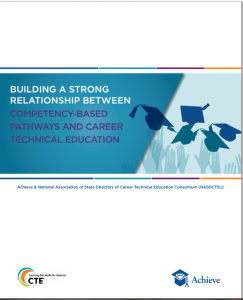 The report highlights further opportunities for states to align adult education and CTE in community colleges. Without labor market outcomes and participation data for students in CTE programs, it is difficult for policymakers to identify challenges or scale successes. Thatâ€™s why a strong state-level data system is core to an effective CTE strategy. 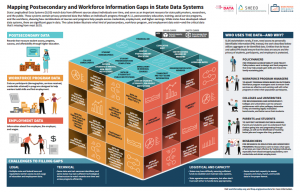 At the postsecondary level, linked data systems (also known as postsecondary student unit record systems or PSURSs) can improve program efficiency, advance student success and provide useful information to policymakers. Serve the needs of constituents. The National Center for Education Statistics released a “Data Point” brief that compares postsecondary outcomes for two cohorts of public high school graduates: the class of 1992 and the class of 2004. The brief finds the largest increase in enrollment rates for graduates earning four or more CTE credits. Families can play a critical role in Science, Technology, Engineering and Mathematics (STEM) learning, but many of them are not equipped to support their children along a STEM career pathway. To combat this challenge, the National PTA Associationâ€™s new white paper, STEM + Families, draws on findings from a national scan of the family engagement landscape to provide recommendations for engaging families around STEM learning. Omicron Tau Theta (OTT), a national honorary professional graduate society in CTE, released its quarterly compilation of research, trends and teaching strategies in the field. This monthâ€™s issue of Professionalism to Practice features research around agricultural education and strategies for CTE instruction. A Snapshot Report from the National Student Clearinghouse examines postsecondary degree records to reveal an interesting finding: two in five associate degrees led to bachelor’s degrees within six years. This emphasizes the need for strong alignment between two-year and four-year institutions of higher education. Researchers from Cornell University recently found that, while CTE programs in blue-collar communities do lead to high-wage jobs after high school, many women in these communities are being left out. As a result, women in blue-collar communities end up with worse professional prospects and lower salaries than men in the same communities. The National Skills Coalition is out with a follow up to its 2014 playbook for implementing the Workforce Innovation and Opportunity Act (WIOA), appropriately titled Realizing Innovation and Opportunity in WIOA. Among other strategies, the playbook discusses how states can integrate effective career pathways into their WIOA state plans.